But some press freedom advocates say they remain concerned. For one thing, the Justice Department could file a superseding indictment, so there is no guarantee that Espionage Act charges will stay out of the case. 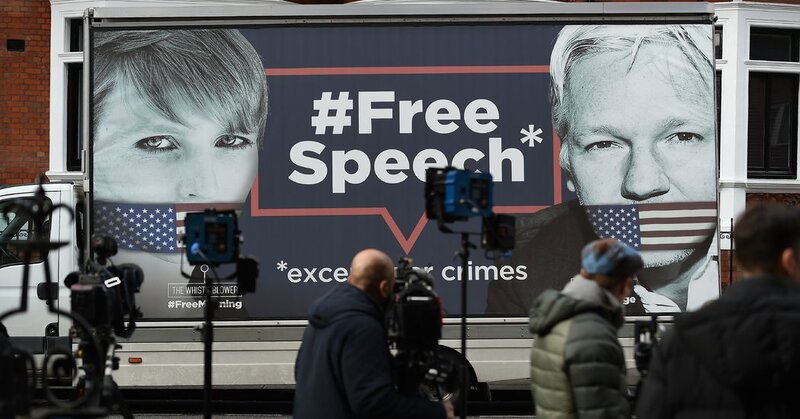 Under extradition procedures, however, any additional charges would most likely have to come soon — before Britain decides whether to transfer custody of Mr. Assange. For another, prosecutors cited details that expanded beyond a narrow focus on cracking the passcode and that sounded like typical activities of a journalist. For example, the indictment talks about efforts to conceal conversations by using a special chat service and deleting certain chat logs. It also says Mr. Assange took a step to help Ms. Manning send him the files, by making a special folder for her to upload files. And it quotes a purported exchange midway through Ms. Manning’s leaks in which she wrote, “After this upload, that’s all I really have got left,” but Mr. Assange replied, “Curious eyes never run dry in my experience.” Several weeks later, according to the indictment, Ms. Manning copied and sent WikiLeaks the diplomatic cables. The Justice Department’s inclusion of those details as relevant to the case was cause for worry, said Jameel Jaffer, the executive director of the Knight First Amendment Institute at Columbia University. Could Mr. Assange be charged later in connection with Russia’s election interference? The Espionage Act does not cover the disclosure of unclassified emails like the Democratic messages, so prosecutors would have to come up with a theory in which publishing them violated some other law. Even if they could find one, a 2001 Supreme Court ruling held that the First Amendment did not permit prosecutors to charge someone with a crime for publishing or broadcasting information so long as no law was broken in acquiring it — even if the source who provided it did something illegal to obtain it. No one has suggested that the Russians needed or had any help from Mr. Assange in hacking Democrats’ emails. And Mr. Assange has denied knowing who his source was; at the time, Russian military intelligence officers created the fictitious online persona of a hacker calling himself Guccifer 2.0 to disseminate and call attention to the files, although evidence that it was most likely a front for Russian intelligence was broadly discussed.